When I first started studying type over ten years ago I read a lot of articles that said the same things over and over again. I’ve been in forums where stereotypes abounded, most of which weren’t grounded in true personality theory. 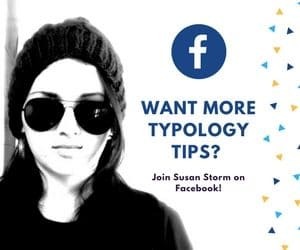 There is a lot of information about type that isn’t widely known, much of which can be found in the official MBTI® Manual. 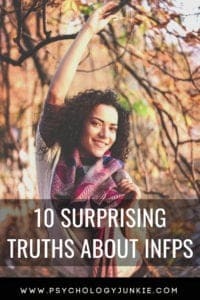 Here are some of the more uncommon facts about the INFP personality type. Keep in mind, a lot of these facts are the result of statistical findings and won’t relate to every single INFP. According to UCLA neuroscience expert, Dario Nardi, INFPs engage all regions of the neocortex when they listen to someone. This is called “holistic” listening. All regions remain alert yet relaxed and open to input. Instead of trying to determine their response or letting their minds wander, INFPs wait patiently and continue to listen for as long as possible. This allows them to get a deep and nuanced perspective of a person’s psychology. According to the MBTI® Manual, INFPs have a general advantage in foreign language learning. Dario Nardi says that INFPs show high activity in regions of the brain that handle language, including diction, grammar, and voice tone. He says that Fi types “hear with precision and insight”. Another statistic from the MBTI® Manual, but this one is not so surprising. You’d be hard pressed to find an INFP without an extensive library! The creative arts are where INFPs shine. This is no surprise considering some of our greatest authors and artists are INFPs. Antoine de Saint-Exupery, A.A. Milne, Edgar Allan Poe, and J.R.R. Tolkien are just a few INFP authors. Vincent Van Gogh was an INFP painter. Somehow this misconceived stereotype has abounded across the type world, and it is blatantly false. Unless an INFP is in an unhealthy state, they are usually some of the strongest believers in their cause. They can be exceedingly brave and determined in even the most dire circumstances if they are defending a belief or value. After all, Joan of Arc was an INFP. INFPs keep their emotions and feelings tucked away and hidden from the outside world. They view their values and feelings as private and guard them closely. In fact, most typology books describe Fi-dominant types as appearing “aloof, cool” or “hard to read”. Even though INFPs have such strong personal values and emotions they will only allow a select few to see them. According to the MBTI® Manual, INFPs feel confident and perform well in artistic activities. However, they tend to choose conventional careers. The manual states, “Performing the opposite activities from what one likes may be creating the tension that leads them to lower levels of satisfaction overall.” With INTPs, INFPs were dissatisfied most out of the 16 types with the kind of work they do, where they work, and future work opportunities. I’m not exactly sure why this is, but they make up 4.2% of the New Zealand population. In fact, in New Zealand there is a larger percentage of introverted and intuitive types overall! Did you enjoy this article? Then you’ll love these! Be Good To Your Body. – ????????????? ?